Ignite your practice. EMpower your soul. The Mobile Om 200 hour teacher training is designed and led by Mobile Om founder Cassandra Fauss, who pulls from over 10 years of teaching yoga, 6 years as a successful yogi entrepreneur and the experience of guiding over 40 souls on their path to becoming certified yoga teachers. 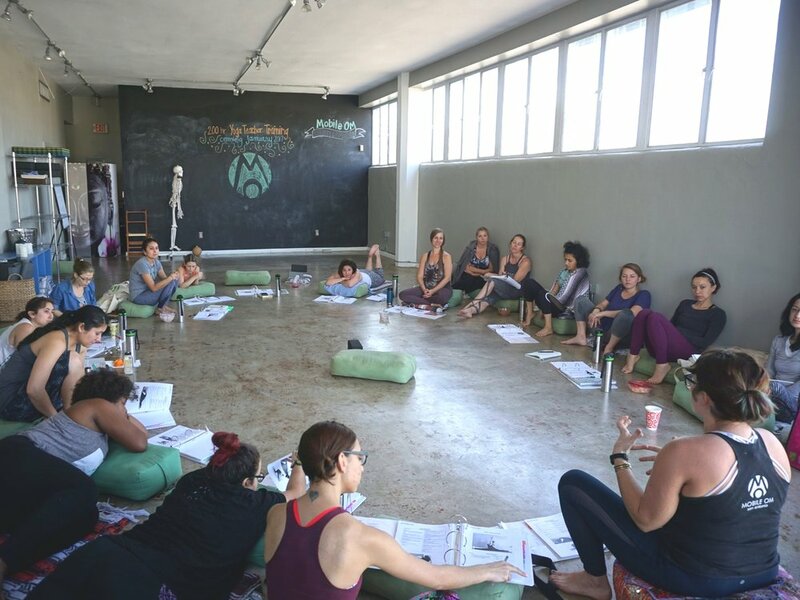 Our program takes a heart and soul-centered approach to developing future yoga leaders, curating a holistic experience that will awaken and uncover your unique voice as a yoga teacher. It is our mission that every instructor leaves this program confident in their ability to not only lead yoga classes with power, confidence, and authenticity but to be mindful and powerful leaders in the world, on and off the yoga mat. Infused with hands-on experience, deep personal development and creative exploration, our 200 Hour Yoga Alliance certified teacher training was designed to get your out of your head and into your heart. Our training of focused on creating teachers who are experts at holding empowered space for others, connecting authentically with their students and leading from a place of authenticity and ease. Our mobile natures also allows us to provide unique opportunities for trainees to practice and teach in unconventional spaces and to a vast array of students. You will learn hot to adapt your teaching to embrace the elements of each unique environment and meet the needs of a wide variety of students. Leaving the program, you will have the tools to step out of your comfort zone and to create from what is right in front of you, leading with clarity, authenticity and purpose and being a cause for extraordinary results in yourself and your students. Submit the form below to be the first to know when we post the dates for our Fall training. Mentorship thoughout the training and continued support after competion to ensure your success as a yoga teacher. Flexible Payments Plans and work/study discount opportunities are available. Please contact us using the form below to inquire! Reach out using the form below and Cassandra will get back to you soon!